Question: Are Hammer suffering from an Arsenal, Wenger-variation, December fall-off in form? It has been a tough month so far – particularly this last week. So, could the Major team reverse the trend? A good result last week for the Hammer squad in Division 5, with a 2.5-1.5 win against a strong Hackney team. With a team scraped together in the last 24 hours, the Hammers rose to the occasion. Nick playing on board 4 was out graded by 15 points but achieved equality comfortably and was never in trouble – hostilities were brought to an end fairly quickly. A point shared. 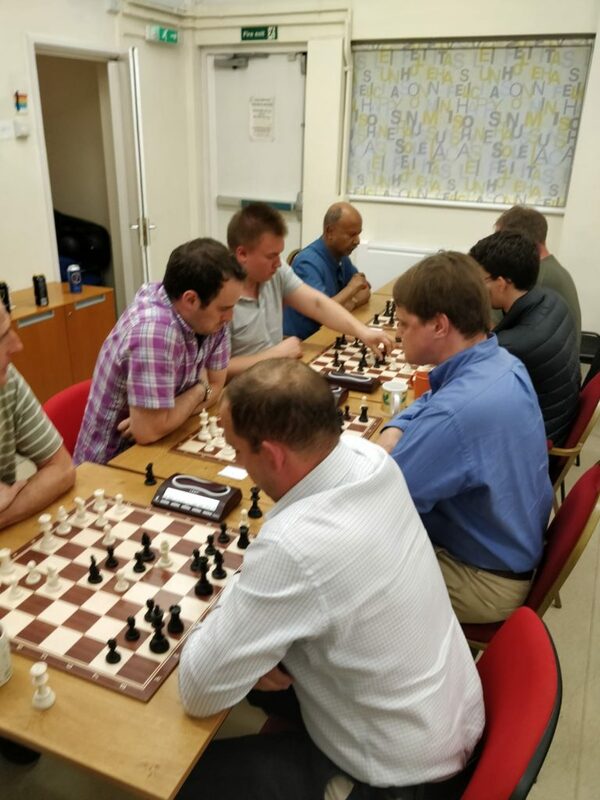 Javier, one of our newest members and making his debut in the London League, played a very controlled game demonstrating really good control in the middle-game. He forced his h-pawn through and snaffled his opponent’s bishop in exchange. He then found a really nice simplification sequence that left him a passed-pawn up, and certain victory. Unfortunately, his technique faltered and he allowed a stalemate. It was simply inexperience that robbed him of a deserved victory. He will get stronger, all the ingredients are there that will ensure he will be a great addition to to Hammer ranks. Both teams locked at one point a piece. Shiraz had a fascinating game where his central pawn majority was offset by a black queen-side majority. In a frantic closure of the game, both promoted a pawn with Shiraz getting the queen check in first but with only two minutes on the clock. His opponent, despite having 20-plus minutes on the clock, continued to move at lightning speed. Shiraz held his nerve and then had to deal with an illegal move from his opponent!! I have never seen what occurred before in a rated chess game, and it is testament to the part nerves play in chess. Shiraz checked the black king which was on b7, with his queen on d7. The Hackney player moved his c6 pawn backwards to c7 to block the check!! Fortunately, I had finished my game and was able to intervene and resolve things – the clocks were stopped and Shiraz gained two minutes on the clock. However, Shiraz wisely took the draw in a position that could easily have gone wrong, especially with just four minutes on his clock. Teams tied at 1.5-1.5. I had a game where I equalised very quickly then decided to probe – a bit of Speelman-think was behind my strategy – fortunately my opponent made an error with 24.Qc3 allowing me to win a piece with Bd4. Interestingly, this happened immediately altering making me a draw offer – I think he thought the position was a dead draw and switched off. A fortunate win, but I will take it. This win takes us to joint second place with four games played. Captain Clueless (delighted to hand back the team to Rich). Sometimes you eat the bear, and sometimes the bear eats you. Such was the case as we succumbed to a disappointing 3-5 defeat to Streatham in London Division 4. That’s a bummer, man. A disappointing night all round, particularly as our opponents were forced to “mark it zero” on Board 8 before we rolled. But it just felt like it was going to be one of those nights. 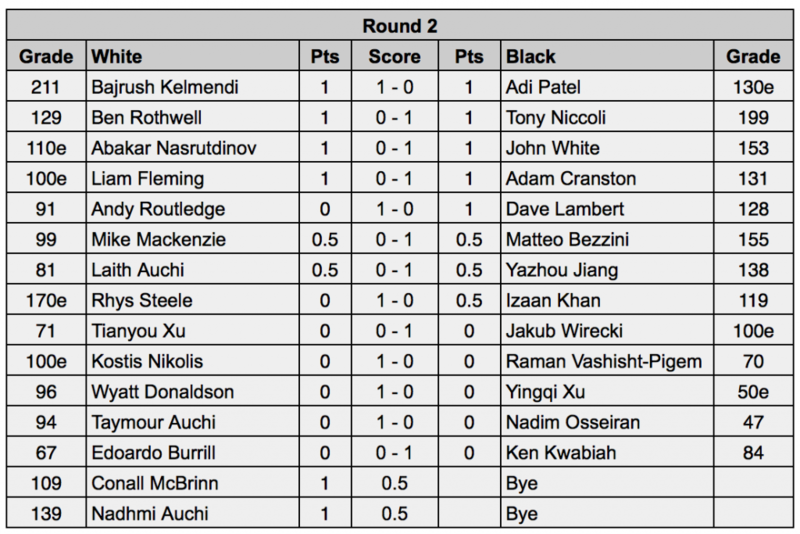 Chances came and went, with several matches slipping away due to individual blunders. Hard to take, but it’s all part of the game. Pavel’s was perhaps the clearest example. Rampaging into a clearly winning position early on with Black, menacing through the Kingside defence and up two pawns, before leaving his Queen en prise. It happens, but it’s still a sickener. Matteo and Simon’s matches played out in similar fashion. Bold attacks that promised much, but the defender found enough resources to survive and suddenly the attacks fizzled into positions where we were simply material down. I felt on another day we might have won both, but that’s just, well, ya know, like, my opinion, man. Our final faller of the evening was Kostis, who miscalculated a minor piece exchange in the middle game, leaving him 3 points down and scrambling to remain in contention. He ploughed on valiantly, but it always looked an uphill struggle. 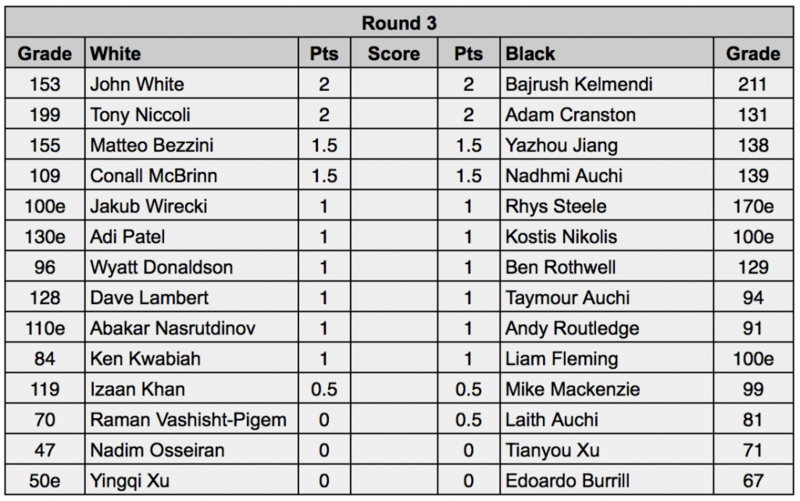 Brian and Sheikh notched up our final tallies with each scoring solid draws. In truth, they both probably had the edge throughout their encounters. Sheikh’s match was even throughout in terms of material, but it was the Hammer man who did all the pressing. A sound defensive display ensured the point was shared. Brian grabbed a pawn advantage with a thrusting attack and held it until the endgame. His opponent’s central two-pawn charge gave him plenty to think about as the clocks ticked down. That’s it from my lot for 2018, but we’ve got a packed agenda in January so make sure you bounce back from all those mince pies refreshed and ready for action. Looking forward to it. The Big Hammer Question This Weekend – What is the most important date in December? Yes, the intellectual bar has been set pretty high, but for true Hammers the answer is the 17th December. Why, you may ask? It is the last club evening of another momentous year for Hammer Chess. The Hammer Blitz tourney starts – the Hammer equivalent of the Royal Rumble in the WWE. This is real caveman chess and a sight to behold. This is the first leg of our annual blitz tournament, with current champion Tony “The Surgeon” Niccoli defending his title against all comers. The threats are many: Wily, The Great Dane, T-Bone, Aramis…… Pickle, Clueless…. the list is endless. Hopefully it will be a Swiss Tourney, depending on Adam having the software available. We will also be presenting some prizes on the night, plus major announcements on a raffle and all the activity to come in 2019. So come and enjoy the last chess hurrah of 2018! If you cannot make it on the 17th, then on behalf of all at Hammer I wish you a Merry Christmas and a Happy and Prosperous 2019. Author HammerPosted on December 7, 2018 December 7, 2018 Categories Club Updates1 Comment on The Christmas Blitz! Unquestionably, in my mind, the greatest musical genius to come out of 8 Mile Detroit is one Marshall Mathers, aka Eminem – in 2002 he released the album “The Eminem Show”, his fourth studio album. One of the tracks was “Without Me” and in homage I start this report with a verse from that song with huge apologies to the great man. Yes, Captain Clueless, former erstwhile and hapless commander of Starship Hammer 1 LL Division 3, has returned to leadership duties. He has been re-assigned to the Middlesex front and has taken control of Hammer 2 Division. Captain Pickle has taken over Hammer 3 but has handed over a superb, battle-hardened and focused squad. They not only achieved promotion last year, but won the Division, and have started with a victory in the first skirmish against the fearsome Metropolitan One. Last night saw the second battle encounter – an away fixture at another tough nut – Albany 1. They have form – last year they inflicted only one of two defeats on the Hammer 1 LL team – they definitely know chess!! Izzy – new member and future star – “The Money” – why, you may ask? Basically, because he is a graduate of LSE and he is up there with Tommaso and Matteo in the sartorial elegance department. In other words, he is in the 1% of chess players who know how to dress. 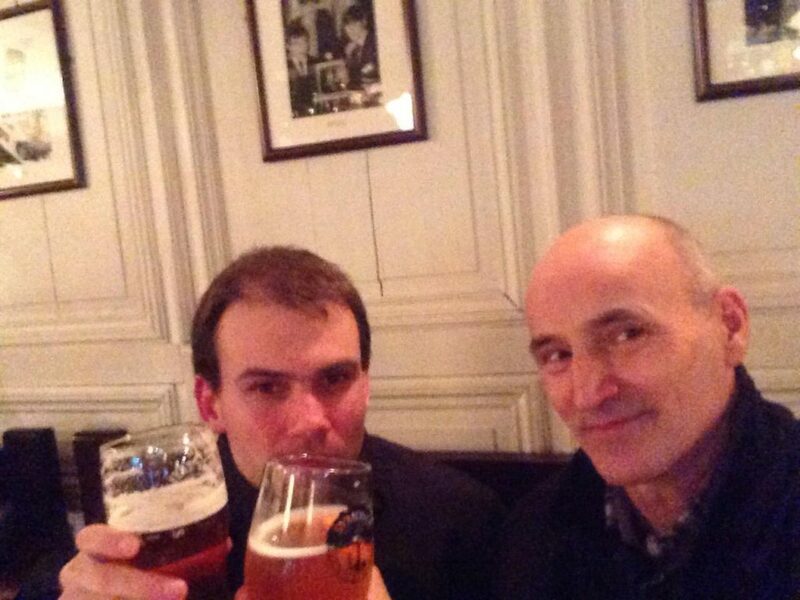 Please note Clueless was a last-minute substitute for Matteo “The Suit“, as he had to call off. Board 2 the Forza playing white had a difficult night. His opponent kept the position closed and did not allow the open positions that our man thrives on. His opponent seized the control of the open b-file gradually and slowly built the pressure – it was tough and very methodical. Although the force is strong in Forza, there was little he could do. Albany had made it 1-1. Board 3 now and Dead-Eye taking on a very technically correct opponent. The position ended up in a K and P ending with his opponent holding an extra pawn. Dead-Eye tried everything to prevent him from realising the advantage but ultimately had to give ground and the point as well. Hammer down 1-2. All-square at 2-2 and things were getting tense. So, using author’s license I am going to skip the encounters of Pandit and Clueless for the time being. Board 7 saw The Gift in imperious form and a beautifully-played game – his chess is definitely maturing and developing rapidly. His was the first game to finish and out Hammer on the scoreboard. Hammer now 3-2 ahead and confidence was growing. 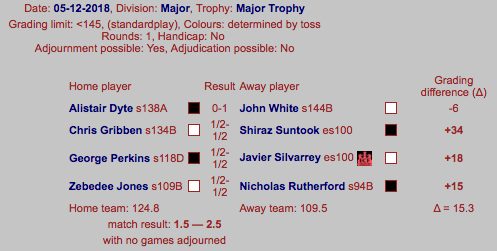 Middlesex debutante Izzy “The Money” was on the money in taking on a wily campaigner in the form of Steve Sonnis, a player whose 129 grade conceals a lot of chess knowledge and skill. The Money played like a seasoned veteran and was never in trouble and comfortably secured the draw. Hammer on the verge, 3.5-2.5 up. Clueless then chipped in with a hard-fought draw, employing his usual tactic of getting his opponent out of his opening repertoire and forcing him to rely on his own resources. 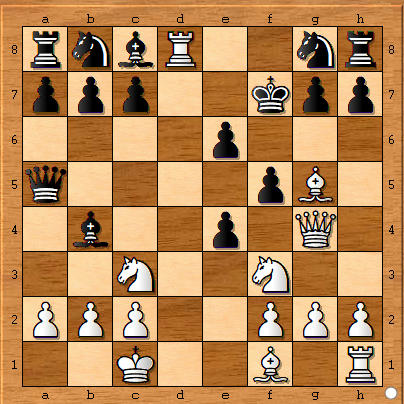 The game ended in a multiple minor-piece and pawn ending, with both sides going for the win. With time running out, a draw offer was made by my opponent and with less than two minutes on my clock, was quickly accepted. Hammer now at 4-3. A half match-point guaranteed – could be the full point. All eyes turned to Pandit, who had been on the back foot for most of the game, however a rash time-trouble move by his experienced opponent allowed him back in. In a flurry of moves and with both flags about to fall, his opponent forced a checkmate. Hammer had just missed out. The match was drawn 4-4, a result Captain Clueless would have taken at the start of the night. A great performance from the team and yet another demonstration of the steely resolve that Hammer teams are displaying this 2018/19 season. Firmly in the Trevor McDonald tradition, here is a seriously entertaining game from Ryszard’s match against Kinds Head 1 in Division 1 of the Middlesex League… enjoy!